Effective January 2013 the FEI (the controlling authority for all international equestrian competitions in Dressage, Jumping, Eventing, Driving, Endurance, Vaulting and Reining) implemented a rule requiring helmet use in areas where they weren’t required before. Originally, the rule change included helmet use in all of the disciplines, but after pressure from vaulting and reining in particular, those disciplines were excluded from required use and there are also a few exclusions in certain circumstances for the other disciplines. A full chart can be found HERE and is also available on the FEI site. I am a big proponent of helmet use every time, every ride for everyone. I believe that wearing a helmet should be the norm and love to see professionals and big-name-riders wearing helmets. I love it when advertisers select photos of riders wearing helmets, and hope to see more of it in the future. There have been a few examples of professionals and big name riders wearing helmets that stand out for me. 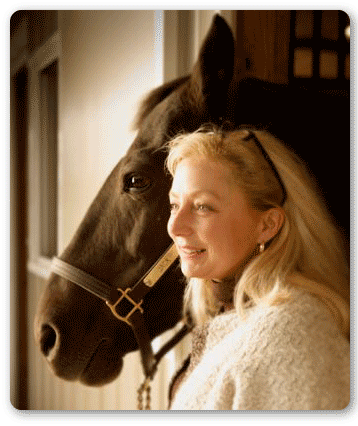 Julie Goodnight is a natural horsemanship trainer that sets a fantastic example of wearing a helmet when she rides. Julie has been wearing a helmet when she rides for quite a few years and the fact that she walks the talk increases her credibility with me. 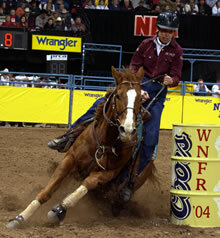 I know there were quite a few raised eyebrows at the National Finals Rodeo in 2004 when Delores Toole became the first competitor to wear a helmet while running barrels at the National Finals Rodeo. When interviewed shortly thereafter, Delores said, “Helmets have become an accepted part of other dangerous sports, and it is time they became an accepted part of western riding and rodeo too.” Good for you Delores! In 2010, Courtney King-Dye, who rode in the 2008 Olympics in Dressage, was involved in an accident where a horse she was riding (not at a show) stumbled. Courtney was in a coma for about a month and is still suffering the repercussions of her traumatic brain injury. Since her injury, Courtney has become a huge proponent of helmet use and is working with www.Riders4Helmets.com to increase helmet use by all equestrians. Courtney says, “I think my accident was necessary in the fight for safety because an Olympian who sustains a brain injury while riding proves that injury has nothing to do with level of skill … my horse wasn’t young or “dangerous”; he just tripped over his own feet.” I’m sad to hear she believes it was necessary for the fight for safety, but unfortunately, I must agree with her. Courtney’s accident raised the awareness that it can happen to anyone. Gradually, we are seeing an increase in helmet use, and I for one am very happy to see it. I can’t wait for it to be the norm for all equestrian riders to wear helmets. I ALWAYS wear a helmet when I ride … will you?